Rail is like a cat with nine lives. While the rail cartel has lost every transportation sales tax hike referendum in Tampa Bay since 2010, they continue pushing their rail agenda. With a sales tax hike now dead for November, the rail cartel shape shifters are morphing into their latest two prong strategy. The first prong is pushing AGAIN to create a regional transit agency that will result in a regional taxing authority. Their second prong is to push our state legislature to allow cities to have their own "transit" (not transportation) referendums to fund high cost rail. These are bad ideas on numerous fronts! In government, bigger is not better nor more efficient, especially over the long term. Bigger agencies just keep getting bigger and bigger and more powerful. Powerful government entities can be a breeding ground for more corruption. When local taxpayers are an arms length away from the decision makers, their influence is diluted while special interest influence increases. It is much harder for local taxpayers to fight a regional taxing authority's bad policies. Regarding city referendums, where is the business model and business case that confirms the cities of Tampa or St. Petersburg could ever fund costly rail projects? Remember Buckhorn was on the only NO vote on the Tampa Streetcar when he was on the Tampa City Council in the 1990's. He said back then the Streetcar did not have a viable financial model. And he was absolutely right. Taxpayers do not want to be responsible for bailing out more rail boondoggles. State taxpayers bail out Tri-Rail in South Florida every year to the tune of tens of millions of dollars. State taxpayers have been forced to pay for SunRail that is drowning in deficits through 2020. If the state legislature ever passed legislation to allow transit referendums by cities, they better ensure there could never be any taxpayer bailouts when the high cost rail projects go financially south and drown in deficits. The reason for a regional transit taxing entity? The entire region would fund the costly rail boondoggles and bail out the financial disasters. The media arm of the rail cartel is doing their part. The TBT published this editorial recently. Any significant change — from merging the Hillsborough and Pinellas bus systems to creating a new regional transit authority to allowing transit referendums by cities — would require action from the Legislature. It's going to take multiple approaches to meet this challenge, from better bus service to express highway lanes to light rail. Too many public officials still lag behind private business leaders in acknowledging the urgency of the issue and agreeing that mass transit including light rail, not more roads, is the long-range solution. The earliest another voter referendum could be held on a new transit plan may be 2020. That's how long it likely will take for any structural changes to transit oversight to be adopted, a premium transit study by the state and HART to be completed, and a new transit vision to be created and sold to voters. State Senator Latvala, Appropriations chair, is pushing for a third time the merger of HART and PSTA. He already forced two taxpayer funded studies previously done and after both studies a merger was rejected. Latvala must not threaten to withhold state funds to our local transit agencies if they don't agree to merge. That is bully tactics and totally unacceptable behavior. Latvala should focus instead on a real problem in his own backyard - reforming PSTA. PSTA has been fiscally mismanaged for years. Latvala should focus on overhauling the incompetent PSTA Board dominated by almost all electeds who continue to provide too little oversight and allow CEO Brad Miller to run amok. It was Brad Miller who misused Federal transit security funds to promote Greenlight Pinellas. That alone should have been grounds for removal. PSTA has too many issues and Hillsborough county taxpayers want no part of them. Merging PSTA into HART is not the answer to PSTA's problems. If Latvala wants better productivity and to save taxpayers money, he should focus on getting rid of agencies we simply do not need. Start by eliminating the Hillsborough County PTC that is the inhibitor to innovation and the poster child for cronyism and corruption. Then get rid of TBARTA which is duplicative, a waste of taxpayer money and their responsibilities can be folded in elsewhere such as FDOT. The 2010 Hillsborough referendum was supported by voters in Tampa, and the 2014 Pinellas referendum won its strongest support among St. Petersburg voters. An analysis of voter data by the Sunbeam Times reveals that the measure failed by a 4 point margin, with 52% of residents voting it down and 48% voting in favor (the county rejected by 62% to 38%). 49 of St. Petersburg precincts voted against Greenlight Pinellas and it was only favored by 40 precincts. It was approved only in a geographically contiguous area largely in the South and East of the city. The Greenlight plan was soundly defeated in Western and northern areas of the city. 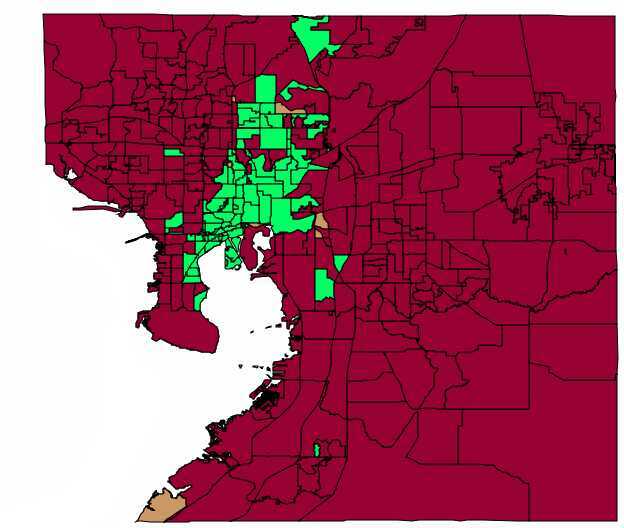 Below is a picture of the precincts (in green) that supported the 2010 Hillsborough County rail tax. Precincts near the proposed rail lines voted for the tax in 2010. However, there were still a significant number of precincts in the city of Tampa that voted against the tax. Since then, voters within the entire Tampa Bay region have become more educated on the issue, thus the even bigger defeat of Greenlight Pinellas in 2014. The Go Hillsborough debacle did not help the rail cartel's cause. It simply added more skepticism and distrust. There is absolutely no guarantee that voters in the cities of Tampa or St. Petersburg will vote for a sales tax hike into perpetuity to pay for high cost trains that few of them will ride. The reality is innovation and technology are and will continue disrupting traditional transit services. Uber and Lyft continue to expand their quasi-transit businesses, UberPool and Lyft Line. We used UberPool numerous times when we were in San Francisco last March and it worked great at a real nice price. "Metro CEO Phil Washington says his agency is building a transit system for 100 years from now, but every day that sounds more disconnected from reality. The future has arrived, and it's on the road. We could be planning for improvements to our freeways, and transit service upgrades made possible by cost-effective driverless buses." Three days later Bryan Mistele, the CEO of traffic firm INRIX, had an op-ed in the Seattle Times, headlined "Sound Transit's Expansion Will Be Obsolete Before It's Built." That plan, estimated to cost $54 billion, would be constructed over the next 25 years, and would provide transit with an additional one percent of daily trips by 2040. He argued that autonomous, connected, electric, and shared vehicles will likely cause the system to be obsolete before it opens. These are sobering thoughts, from a transportation professional who is very knowledgeable about these disruptive forces. A wave of new transportation technology is coming to Columbus after the city won the federal Smart City Challenge. The grant money will usher in driverless cars but could end the idea of rail as a mass-transit option. “The City of Columbus plans to leap-frog fixed rail” by using new modes of transportation, Columbus says in the U.S. Department of Transportation application. The reality is the window of opportunity for building costly rail systems is quickly closing and our local rail cartel surely understands that. As costly rail becomes passe, the Feds and the States may stop funding costly outdated rail projects as more cost-effective, flexible and more efficient transportation solutions are available. The best place to be to take advantage of the biggest transportation disruption since the automobile is to stay flexible and not get financially forever locked into costly projects. It's exciting times for transportation as innovation is fast emerging. From platooning and "connected" vehicles to autonomous vehicles and buses to deliveries being made by drones, we will be able to more efficiently utilize our existing rubber-wheeled infrastructure. The rail cartel needs to change course because they have lost every transportation sales tax hike referendum they have championed. They must respect the will of the voters, the will of the taxpayers and the consent of the governed. Stop trying to push tax hikes for costly trains! Because Tampa Bay is in a great position to take advantage of new technology and innovation. Instead of looking in the rearview mirror, we can charge ahead and lead the way in Transportation solutions for the future. Remember what happened to Tri-Rail. That's what we used to call the commuter rail that runs roughly from South of Ft Lauderdale to the Miami airport. The 3 counties that it served ponied up with several million per year in the beginning. then the recession hit and they just quit. They said we need to cut funding to transportation. So they just walked away from their promises and left the rest of us holding the bag. Gov Crist called a special session of the legislature. That session passed $16 million of annual funding to the Florida taxpayers, plus a large chunk of change from the Feds. Now they want to expand it. Does that mean they are going to assume the $16 million annual payments we are paying to support their train? What do you think? Who will backstop the Buckhorn Limited when it crashes and burns? Who do you think?